Miniatures are available here NOW! With great pride we now present to you the gorgeous Ortus miniature line, designed for miniature enthusiasts and tactical boardgame players alike. Upgrade your base game of Ortus with the metal beauties. This is your chance to own a true Coffee-table piece, other than a hand-carved chess set or an antique Go board. Every warrior is designed with the greatest care to capture the Element that they are schooled in. From the elusive wind to the fatal waters, the strength and characteristic of each piece really comes to life in your hands. All miniatures shown here were lovingly painted by ThatAmigo. The full miniature line is available now. Go to the FableStore if you want to get your hands on these fantastic pieces of art. Note that the miniatures are display painted (curtsy of ThatAmigo) but are shipped to you unpainted. Ready for your brush to make them your own! Are you interested in the process a miniature goes through before it’s available to the public? Here’s a comprehensive blog about the creation of the Spirit warrior, from initial idea, up to the painted miniature. Many artists are involved in the process of a single miniature, a great look behind the curtain. Enjoy! 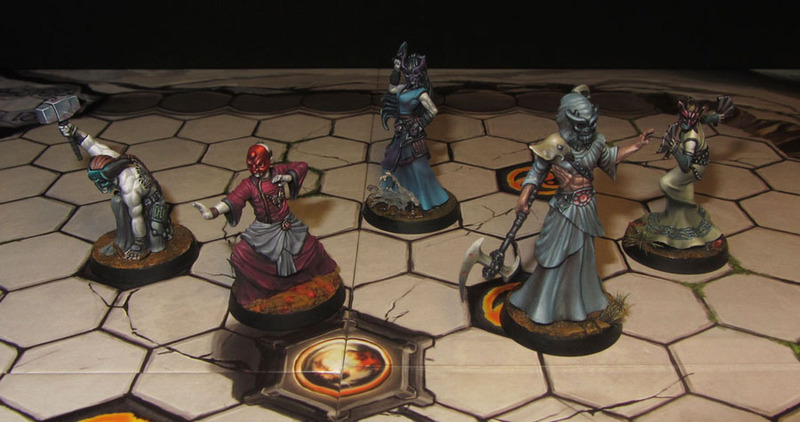 Both players will enter the Ortus arena with 8 miniatures on their side. To differentiate between the two players, Tiger House and Serpent House have some difference between them. A full miniature set will ship with 9 black and 9 red bases, so even an unpainted set can still look great and function easily. Also you will notice in the pictures above that all the warriors of Serpent House have masks and the warriors of Tiger House do not. Furthermore, you can use completely different color schemes between the two Houses, so it’s immediately clear which warrior miniature is fighting for whom.